One of the main objectives of the WHO is controlling transmission of parasitic protozoa vector- borne diseases. A quick and precise diagnosis is critical in selecting the optimal therapeutic regime that avoids unnecessary treatments and the emergence of resistance. Molecular assays based on Loop- Mediated Isothermal Amplification (LAMP) techniques are a good alternative to light microscopy and antigen-based rapid diagnostic tests in developing countries, since they allow for a large amount of genetic material generated from a few copies of DNA, and use primers that lead to high sensitivity and specificity, while the amplification process can be performed in isothermal conditions without the need of sophisticated equipment to interpret the results. In this review, the main advances in the development of LAMP assays for the diagnosis of malaria, leishmaniasis and Chagas' disease are discussed as well as the feasibility of their implementation in developing countries and use as point- of-care diagnostic tests. Keywords: Loop-mediated isothermal amplification (LAMP), Leishmaniasis, American trypanosomiasis, Chagas disease, Malaria, diagnostic tools, Primers, Point-of care tests. Keywords:Loop-mediated isothermal amplification (LAMP), Leishmaniasis, American trypanosomiasis, Chagas disease, Malaria, diagnostic tools, Primers, Point-of care tests. Abstract:One of the main objectives of the WHO is controlling transmission of parasitic protozoa vector- borne diseases. A quick and precise diagnosis is critical in selecting the optimal therapeutic regime that avoids unnecessary treatments and the emergence of resistance. 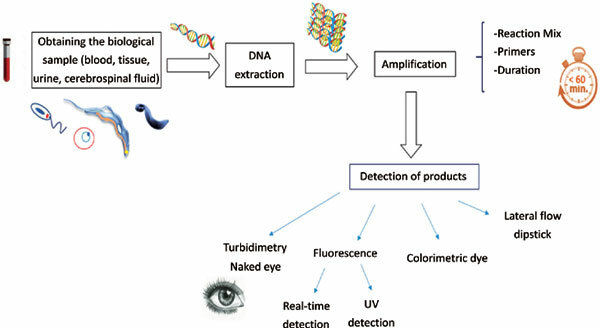 Molecular assays based on Loop- Mediated Isothermal Amplification (LAMP) techniques are a good alternative to light microscopy and antigen-based rapid diagnostic tests in developing countries, since they allow for a large amount of genetic material generated from a few copies of DNA, and use primers that lead to high sensitivity and specificity, while the amplification process can be performed in isothermal conditions without the need of sophisticated equipment to interpret the results. In this review, the main advances in the development of LAMP assays for the diagnosis of malaria, leishmaniasis and Chagas' disease are discussed as well as the feasibility of their implementation in developing countries and use as point- of-care diagnostic tests.